dhtmlxCalendar provides the ability to limit the range of dates users can select from. Users cannot select dates outside this range, since those dates become inactive. DHTMLX date picker supports any number of languages which can be switched on the fly. You can also define the first day of the week and date format. View sample. 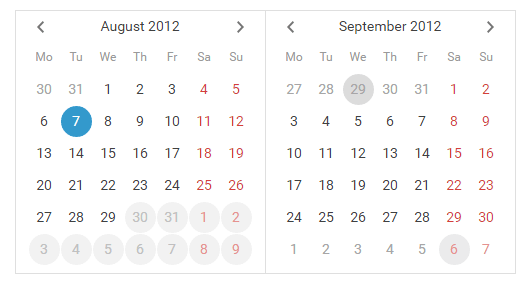 You can specify dates or date ranges which become inactive on the calendar. These are "blackout" dates which the user cannot select. View sample. You can define certain dates as holidays, and they are marked appropriately on the calendar. View sample.